Shark Diving Liveaboard Australia 7 Night Coral Sea Safari. 7 Nights / 26 Dives. This fabulous 450 mile expedition combines adventure diving in the Coral Sea with superb Great Barrier Reef marine biodiversity. 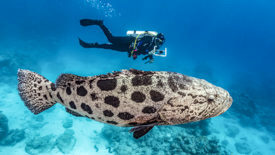 *Combines the 4 night Fly Dive Coral Sea expedition with the 3 night Fly Dive Cod Hole expedition, making a fantastic and varied loop. There is no scenic flight included in this itinerary however you can enjoy a few hours exploring Lizard Island mid-expedition. 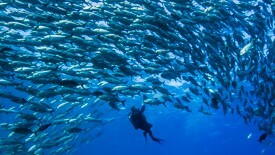 Osprey Reef, Coral Sea – Big fish action in 40 metre visibility, 2-3 shark attraction dives. Spectacular topography, sheer walls, soft and hard corals. 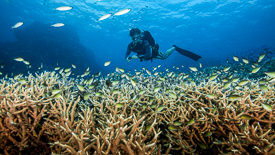 Ribbon Reefs, Great Barrier Reef – a prized region with excellent fish & coral biodiversity. Lizard Island – enjoy an hour or two exploring beautiful Lizard Island – white sand beaches and a short hike to Chinaman’s Ridge. Cod Hole – Swim with diver size potato cod. Dive the GBR – Joanie’s Joy, Clam Beds, Lighthouse Bommie, Pixie Pinnacle, Goggle Gardens, Flare Point, Trolly Shoals, Steve’s Bommie. 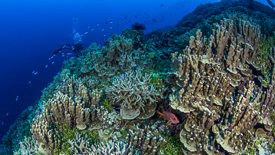 Holmes Reef, Coral Sea – dozens of sharks, spectacular Nonki Bommie covered in soft corals. Bougainville Reef, Coral Sea – Dungeons & Dragons labyrinth of caves & caverns, giant potato cod, big fish at Crystal Plateau. Osprey Reef, Coral Sea – 2-3 shark attraction dives. spectacular topography, sheer walls, soft and hard corals. Big fish action in 40 metre visibility. Dive the GBR – Joani’s Joy, Clam Beds, Lighthouse Bommie, Pixie Pinnacle, Goggle Gardens, Flare Point, Trolly Shoals, Steve’s Bommie. September to January, most reliable Coral Sea access. If itinerary B doesn’t proceed, reverts to A. Soft coral and sea fan enthusiasts will love this dive. Nonki Bommie rises to the surface from 35 metres and it is split with a huge crack down the middle filled with giant yellow and orange sea fans. 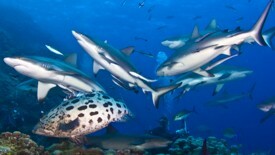 Sharks and other fish are attracted to the site, making for an exciting dive. A maze of bommies create tunnels and swim throughs, great to explore. The site provides a great habitat for fish as well as creatures such as octopus, cuttlefish and rock lobster, plus it’s a hotspot for grey reef and silvertip sharks which patrol the shallow reef wall. The reef top descends to a spectacular terrace of hard corals at 20-30m before edging over into an abyss hundreds of metres deep. Sea fans and soft corals adorn the reef wall where sharks also patrol. The reef top here is cut with an incredible maze of caves, tunnels and swim throughs – great to poke around to discover fish and other critters. Or venture beyond the shallows to a wall descending to around 1000m, where you can find sharks and barracuda. Named after an anchor lodged midway through a tunnel that makes for an exciting swim through. A maze of huge towering bommies are home to plenty of fish and a delight to explore. Below them a sheer wall attracts sharks and occasionally manta rays. Welcome to shark central! 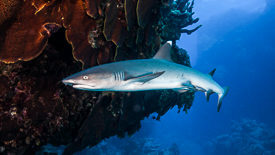 Watch a controlled shark feed with 10-30 grey reef, white-tip reef, silver tip sharks. Keen photographers will have the opportunity to do a private shark shoot dive with limited numbers of divers, ensuring fantastic, clean and up close photos. Read more. This site never disappoints with exciting fish action alongside colourful gorgonian fans, whips and soft corals. Resident barracuda and schooling big eye trevally make for great photo opportunities, and keep an eye out for cruising hammerheads out in the blue. Mid-expedition we moor off Lizard Island, saying goodbye to some guests and welcoming new ones. You will have a few hours to relax on the beach, go for a swim or climb the hill to Chinaman’s Ridge for a view. One of our crew members will show you around. The Cod Hole is famous for its diver-sized potato cod. These fish are incredibly inquisitive and don’t mind getting very chummy with divers. A great opportunity to capture photographs of these magnificent characters or a simply hang out and enjoy their company. An exciting pinnacle dive, draped in soft corals and absolutely heaving with fish life. Spiral your way up the pinnacle and search for interesting critters such as the flame file clam, or ‘disco clam’, named for the flashing light that appears to pulse along its mantle. A fantastic coral dive with vast beds of staghorn and other varieties, and dotted with colourful giant clams. Bump headed parrotfish and inquisitive barracuda cruise the site along with schools of other reef fish. Steve’s Bommie is a photographers dream with an incredible quantity of diverse marine life. Hunt out such creatures as stonefish, scorpionfish, octopus, clown anemone fish and turtles, not to mention the many schools of fish that call this place home. Spoilsport’s outstanding stability minimizes disruption to your itinerary and your scuba diving experience. If weather forces an itinerary change we divert to the best, ‘safe, accessible sites’ to ensure you get the best scuba diving available. 9% of Coral Sea itineraries are diverted to the Great Barrier Reef. No expeditions found. Try broadening your search. Expedition prices, per person in Australian dollars. Please note that the Great Barrier Reef Marine Park Authority requires us to collect an Environmental Management Charge of $6.50 per day spent on the Great Barrier Reef. This amount will be added to your bar bill at the end of your expedition. 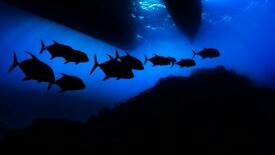 Click on the links here for extras such as dive courses, photo services and gear hire, nitrox, etc. Premium – queen or double bed, private bathroom, ocean views. Standard – twin beds, private bathroom, ocean views. Club – twin bunk beds, private bathroom, no ocean view. Budget – twin bunk beds, share bathroom, no ocean view. Check in at our office (3 Abbott St, Cairns) between 8:30 am and 4:00 pm. From 4:30 pm: Make your own way to Mondos Café, Bar & Grill (200m from MBDE office) to meet your fellow passengers. Please note that dinner is not provided on the first evening so you may wish to eat before boarding. 5:50 pm: Our crew will lead you from Mondos to board Spoilsport. Enjoy a glass of champagne and light snacks while your Trip Director provides a full briefing. 6:00 pm: Spoilsport departs Cairns. Time to organise any rental equipment and put your dive gear together on the dive deck. Friday: (4 dives + night dive) This is a sample of a ‘typical day’, however exact times may vary to optimise the prevailing weather conditions on the day. As per above, however all diving is finished by 5pm. Spoilsport moors off Lizard Island for the evening. As the sun sets we pour the champagne, lay out the nibbles and get ready for an Aussie BBQ party night. Don’t forget to wear your loudest tropical shirt or dress and sing along to music played by our talented crew. 8:00 am: Bid farewell to passengers doing the 4 night Fly Dive Coral Sea Expedition who will disembark here. 8:00 am: Stay onboard or take a tender over to Lizard Island to stretch your legs and explore a little of this beautiful island. 11:00 am: New passengers join us here. Drinks and light snacks provided. As per above. Exit last dive 5pm. As the sun sets we pour the champagne, lay out the nibbles and get ready for a final farewell party! 8:00 am: Disembark and courtesy transfer to Cairns inner city hotels, the airport or our office where we can store your luggage until 5pm if you have a later flight. We recommend that you allow 24 hours between your last dive and your onward flight (all diving is finished by 5pm Wednesday). Advanced, or 10 logged ocean dives inc. 5 in last 12 months. Thursday 6pm – Trinity Wharf, Cairns.